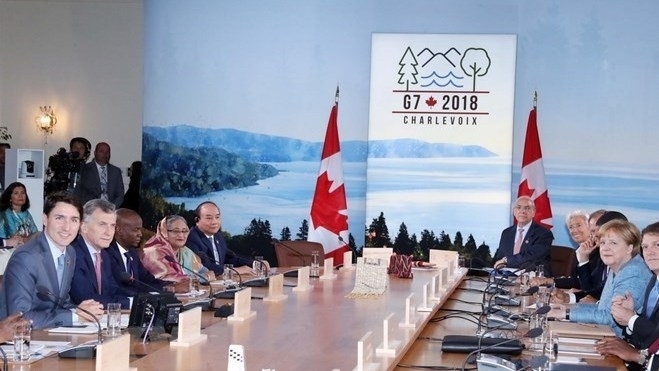 Vietnam and Bangladesh are the only Asian countries to be invited to the G7 Outreach Summit in Charlevoix region, Canada’s Quebec state, from June 8-10, proving that G7 member states and the host, Canada, highly appreciate Vietnam’s role and stature. During a meeting with the press to announce the outcomes of Prime Minister Nguyen Xuan Phuc’s visit to Canada and his attendance at the meeting, Deputy Foreign Minister Ha Kim Ngoc said the Prime Minister initiated ideas to foster global cooperation in response to climate change, discharge of plastic wastes into oceans, and maintenance of peace, stability and respect for international law in sea areas, which were welcomed by leaders and international organisations at the event. The PM held 14 meetings with leaders of countries and international organisations to raise mutual trust and understanding, call on countries and international organisations to support Vietnam’s run for non-permanent member of the United Nations Security Council for the 2020-2021 tenure, and attend the World Economic Forum on ASEAN 2018 in Vietnam in September. He held talks with his Canadian counterpart Justin Trudeau, met Governor General of Canada Julie Payette, former PM Jeans Chretien, Premier of Quebec Philippe Couillard, attended a dialogue with leading Canadian firms, and visited Laval University. The two countries’ leaders affirmed the policy of appreciating each other in the external policy of each country and expressed their wish to strongly develop comprehensive partnership. During their talks, the two PMs agreed on measures to step up political and diplomatic ties, trade-investment, national defence-security, development cooperation, culture-education, science-technology and people-to-people exchange, as well as in regional and global issues of shared concern. Both sides signed several cooperation agreements on science-technology, education-training and transport infrastructure. Via the visit, the two countries’ leaders created a driving force for the effective and practical development of bilateral comprehensive partnership that was established during Canadian PM Justin Trudeau’s Vietnam visit in November 2017. In the near future, the two sides will step up cooperation in seven priority fields of politics-diplomacy, trade-investment, development cooperation, national defence-security, culture-education, science-technology, and people-to-people exchange for the benefit of the two peoples, and for peace, stability, cooperation and development in the region and the world, Deputy Foreign Minister Ngoc said. About the significance of the summit’s theme to Vietnam, Deputy Foreign Minister Ngoc said Vietnam has a long coastline and is hard hit by climate change, especially in the Mekong Delta where tens of millions of people are suffering from the impacts of rising sea water and widespread salinisation. Therefore, the theme of seas and oceans is not only of concern of the world but practical to Vietnam. The PM’s active discussions on seas and oceans at the summit affirmed Vietnam’s strong commitments and reflected Vietnam’s responsibility for fighting climate change and marine ecological protection. On the occasion, Vietnam called on countries and international organisations to support it in the effort. As regards Vietnam’s role and contributions to the event, Deputy Foreign Minister Ngoc said the PM offered two initiatives which were welcomed by participants, including establishing an extended forum on response to climate change and marine ecological protection among G7 member states and coastal nations to share experience and facilitate technology transfer. The PM urged international community to establish a global cooperation mechanism on preventing plastic wastes discharge towards the goal of green and clean oceans, as well as support Vietnam’s initiative on a regional project for an ocean free of plastic wastes to be mentioned at the 54th Meeting of the Global Environment Facility Council scheduled for late June in Vietnam, Deputy Foreign Minister Ngoc said.